In human psychology, self-handicapping is a term used to depict those situations where people make excuses for their poor performances so to justify their potential failure, and therefore, protect their self esteem, but in the dog world, the term self-handicapping has a quite different meaning. In dogs, self-handicapping is mostly seen in social situations, and its most relevant application is seen during play. If you ever frequented a dog park or watched dogs of different sizes play, you may have perhaps seen this endearing phenomenon take place many times. 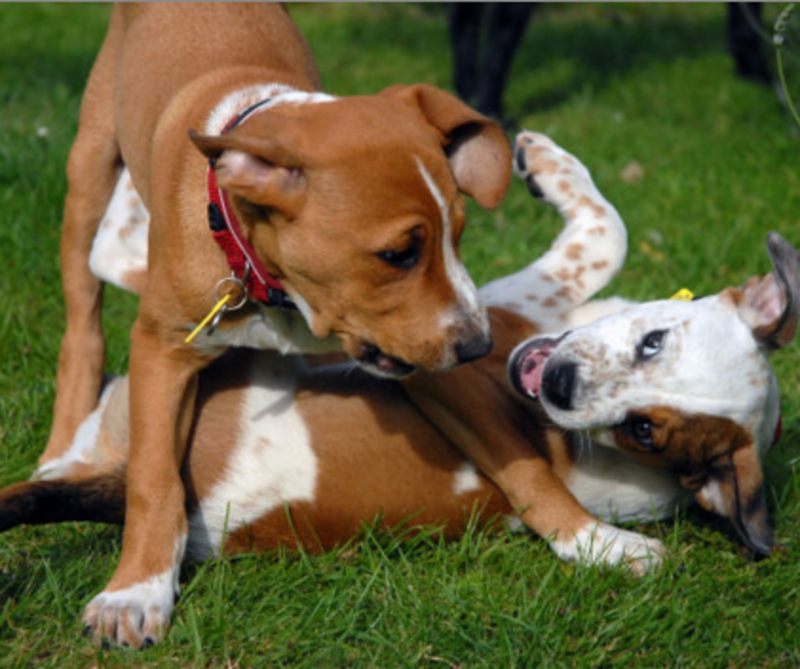 Dog play often incorporates elements that are drawn from other “serious” behavior contexts. There may be elements seen in hunting (stalking, pouncing, chasing), elements seen in fighting (growling, snapping, biting) and sometimes even elements seen during courtship and mating (mounting). As in children play, puppy play often entails enactments of things dogs will be doing in their adult lives (there are also patterns that are unique to play though). What differentiates play from real fighting though? How can dogs communicate playful intentions, without getting in trouble with other dogs? 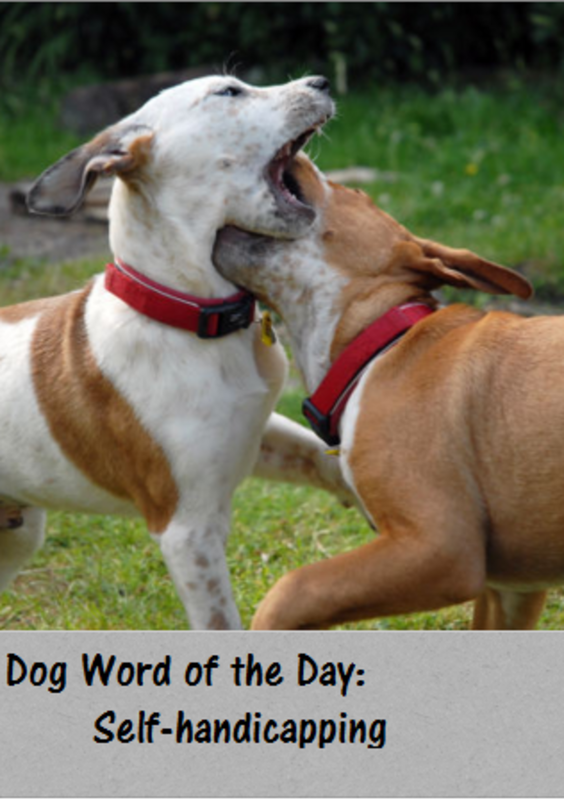 For starters, well-socialized dogs use meta-communication signals (meta-signals) which are meant to tell the other dogs that they are playing and that anything that follows is not to be taken seriously. A common example of a meta-signal is the quintessential play-bow, which in a sort of way is the equivalent of a child saying “let’s pretend!” This signal informs the other dog that anything that follows is just play and it’s not to be taken seriously. Other than using meta-signals, dogs who have learned to play appropriately know that, in order to keep play safe and from getting out of hand, they must fine-tune their tactics and inhibit/restrain themselves so to prevent conflict which may arise when there is too much loss of control. When dogs play together, there are chances that one dog is much bigger, stronger, healthier, more confident or faster than the other, and if no restraint occurs, this bigger, faster and stronger dog may eventually end up not playing fairly, or worse, frightening or hurting his play mate. Fortunately, on top of inhibiting themselves as they do normally with dogs who are similar to them, dogs have also shown the capability of adjusting their play styles when they sense that a playmate is disadvantaged in some way. “Self-handicapping occurs when individuals place themselves in disadvantaged positions or situations that could make them more vulnerable to attack by ‘opponents.” Camille Ward et al. A dog with superior abilities plays the role of being the weaker party. You may see this when a large dog “turns the tables” and allows a smaller dog to chase him as seen often in role-reversals. In such an instance, self-handicapping may occur simultaneously with role reversal. 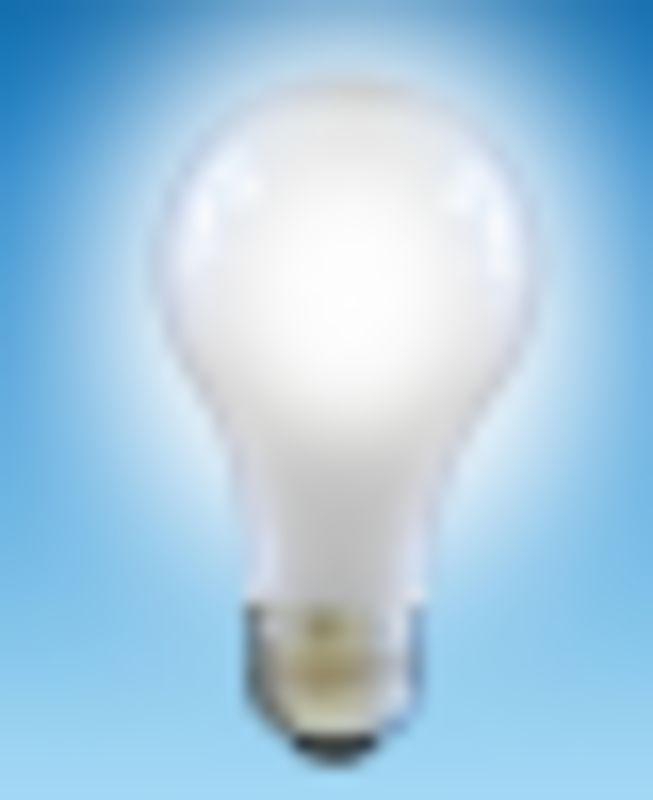 A dog with superior abilities puts himself in disadvantageous positions or situations. 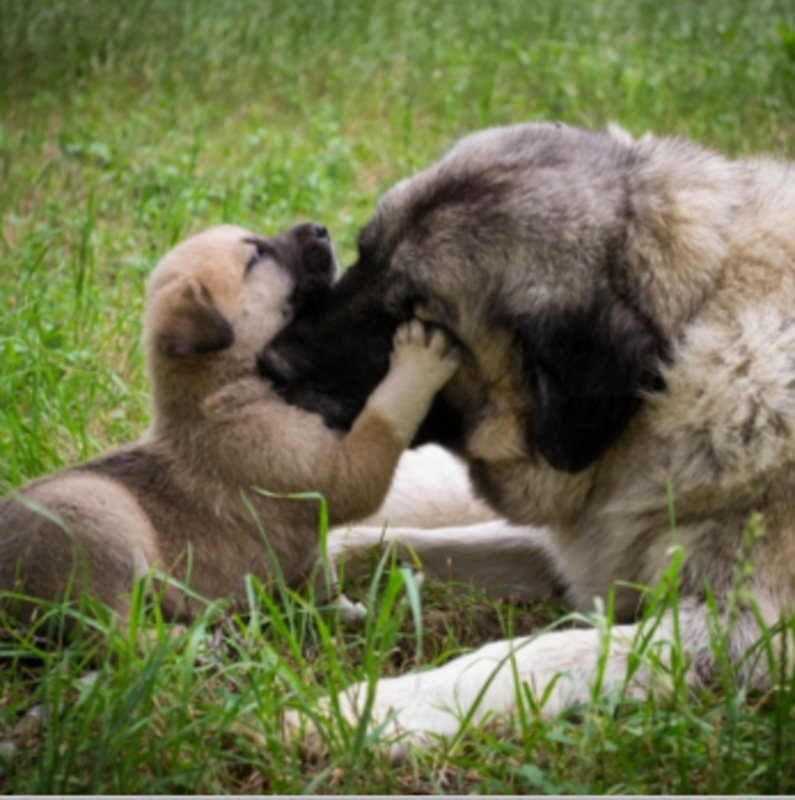 An adult dog may keep his head lower or stay in a vulnerable belly-up position when he plays with a puppy. 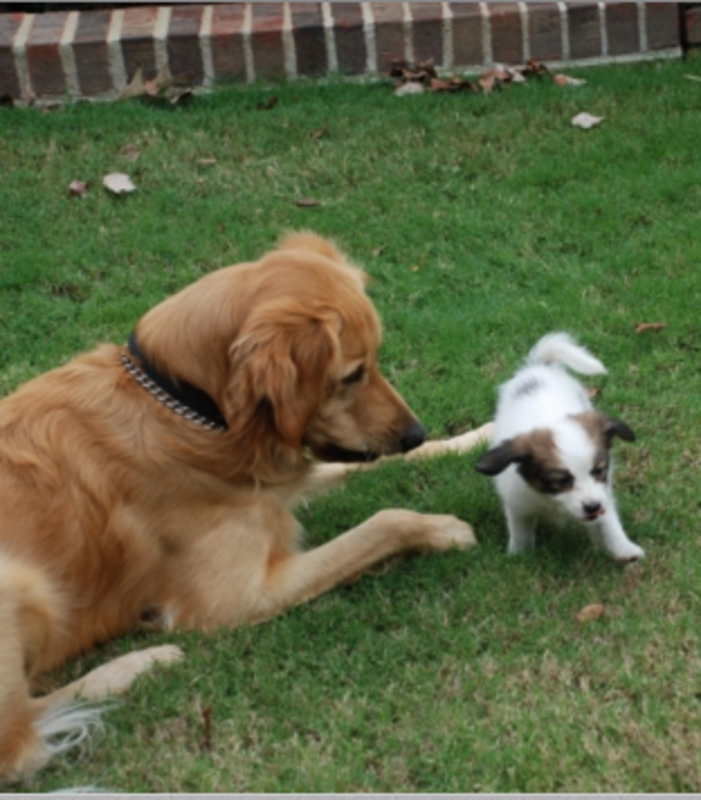 A dog with superior abilities adjusts his playing style to facilitate the play partner. The stronger dog may tug more gently with a dog that’s half his size. A dog plays with a cat by lying down on the floor and engaging in very light paw touches and gentle mouthing behaviors. What’s the function of self-handicapping? 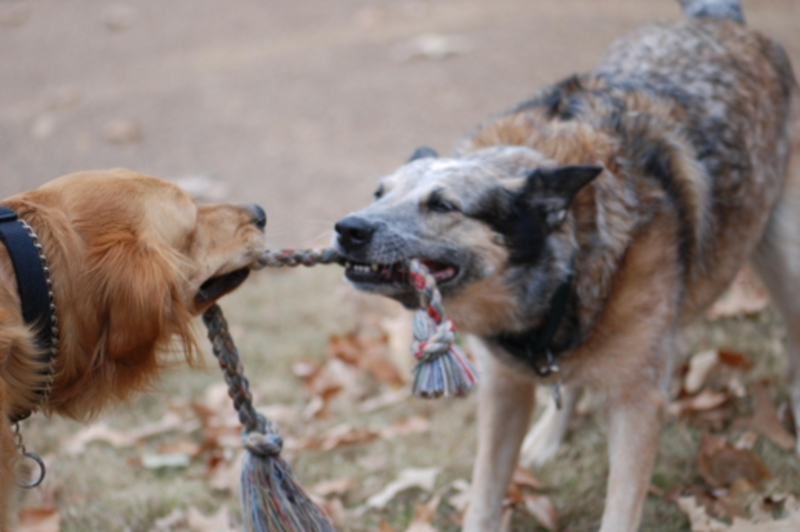 Why would a dog give his playmate a competitive advantage? Most likely because it shows playful intent and keeps the game going. When a stronger, faster or bigger dog decides to put himself at a disadvantage, he’s likely doing so to keep his opponent “in the game.” It’s similar to a father who kicks the ball lightly and allows his child to win every now and then. In dogs we might never know if there are any similar “altruistic” emotions going on, but it’s function appears to be to keep the interaction going and keep play session alive. Self-handicapping is sure an endearing behavior to watch, but not all dogs know how to apply it. Self-handicapping is a voluntary behavior that requires the dog’s ability to judge his playmate’s abilities and then make the necessary adjustments to maintain the play session worthy of continuing for both parties. This requires a great level of self-control in the midst of play which can become difficult to gauge when arousal levels get high. It’s a learning process that may take time as dogs mature and learn to control themselves better. Dog owners though can help by teaching their dogs better emotional control through structured games such as Ian Dunbar’s Jazz up and Settle Down game and by stepping in when their play with other dogs gets too rough. “We know that in feral dog populations, female mate choice plays a role in male mating success, perhaps males use self-handicapping with females in order to learn more about them and to form close relationships with them — relationships that might later help males to secure future mating opportunities,”said Ward, in the study. The Other End of the Leash, Play and Self-Handicapping, by Patricia McConnell, retrieved from the Web on March 30th, 2016. NBS News, When Puppies Play, It’s Ladies First, By Jennifer Viegas, retrieved from the Web on March 30th, 2016.